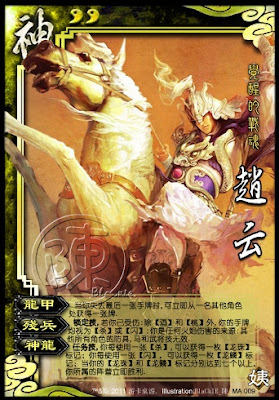 When Zhao Yun uses his last hand card, he can immediately take a hand card from any other player. If Zhao Yun is damaged, all hand cards except peaches and wine are attacks or escapes. He is the source of all fire damage. All other weapons, horses, and armor cannot be used against Zhao Yun. Whenever Zhao Yun attacks, he gets a Dragon Pearl. Whenever Zhao Yun uses an escape, he gets a Dragon Scale. After Zhao Yun has at least eight of each, he gains the following abilities: Zhao Yun's attacks have unlimited range and he can use as many per turn as he would like. Zhao Yun can also use a Dragon Pearl as an escape and a Dragon Scale to attack. He does not draw a new token for this. In "Broken Soldier", even the reach of horses cannot be used. This makes it very difficult to reach Zhao Yun after he is damaged. Zhao Yun can acquire more than 8 Dragon Scales or Pearls. Once he has at least 8 of each, then he can start to use them.